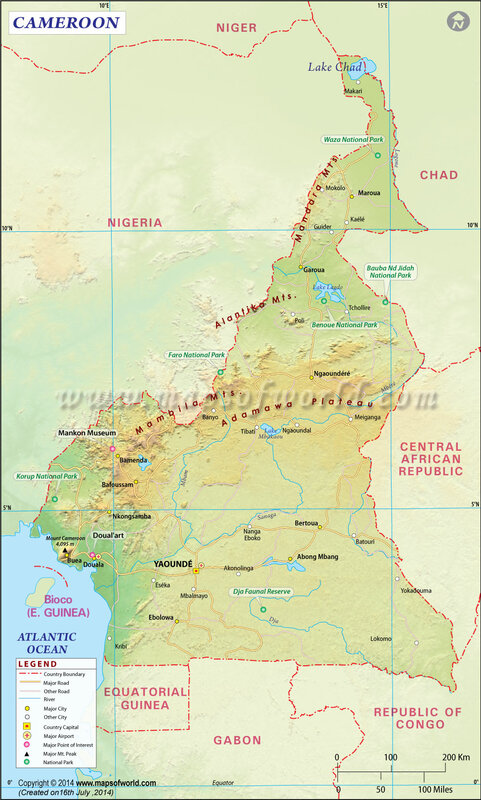 Cameroon, located in Central Africa is bordered by Nigeria, Chad, Central African Republic, Equatorial Guinea, Gabon, and the Republic of the Congo. 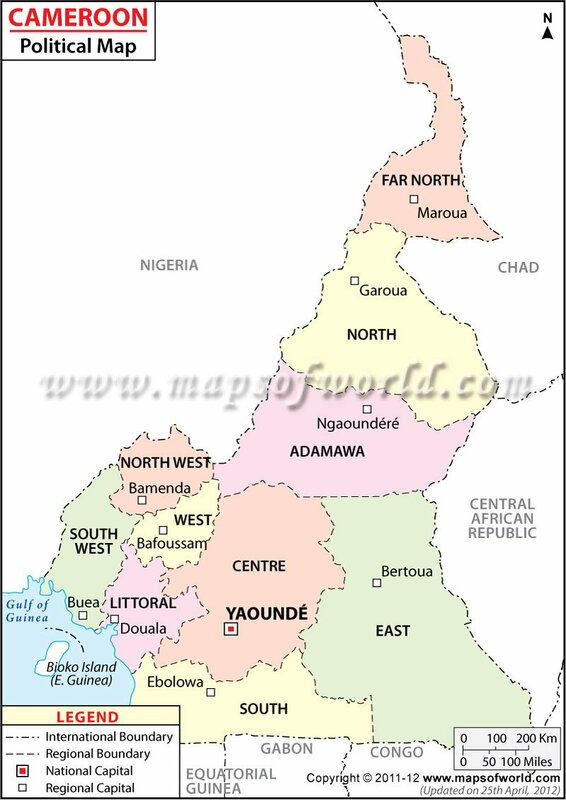 Its capital is Yaounde. The official flag of Cameroon is a tricolor flag with Green, Red and Yellow colors. The flag is divided vertically into 3 different colors. The flag also contains a yellow star which centers the flag. The Republic of Cameroon is a Central African nation, which was historically divided under the rule of France and Britain after World War II. The history of Cameroon dates back to at least the 6th century BC, when the Sao civilization covered much of the land around Lake Chad. European explorers arrived in Cameroon beginning with the Portuguese in the 15th century. The country's name came from the Portuguese word for shrimp, Camarões, because of the shrimp in its river. Cameroon was colonized by Germany in 1884 and remained under German power until the end of World War I, when France and Britain divided control, despite calls for independence. French Cameroon gained independence first in 1960, and British Cameroon followed a year later, creating the Federal Republic of Cameroon. The name was changed to the United Republic of Cameroon in 1972 before dropping the “United” in 1984. Cameroon is bordered by the Atlantic Ocean at the Bight of Bonny in the Gulf of Guinea Nigeria, Chad, Central African Republic, Equatorial Guinea, Gabon, and Republic of the Congo. Cameroon features diverse geographic features, including the beaches along the coast, mountains, deserts, rainforests, and savannas. The forests of the Cross-Sanaga-Bioko coastal plains are some of the wettest places in the world. The Cameroon mountain range features the country's tallest mountain, Mount Cameroon, which stands 4,095 meters (13,435 feet) tall. These mountains are volcanic, with crater lakes. The main rivers in Cameroon are Ntem, Nyong, Sanagaa, and Wouri, which drain in the Gulf of Guinea, and the Dja, Kadei, Benoue, and Logone Rivers. Douala is Cameroon's largest city, which has beaches, most popularly Limbe, where there are many great places to enjoy seafood. Other places to visit in Douala are the Douala Memorials, and La Pagode. Cameroon has many options to experience and enjoy its diverse natural wonders, including Mount Cameroon, which is not only the highest in the country, but also the highest in West Africa. Other places to see are Dja Faunal Reserve, the scenic but rugged Ring Road, and Ngoketunjia, where visitors can experience the culture of the native peoples, including the bantu and the fulani, in their villages. Entry to Cameroon usually occurs via Douala International Airport. Around Douala, most people take shared taxis, which group together various passengers who travel in the same direction. This option is common and much cheaper than requesting a solo taxi. Chauffeurs are also common, though checkpoints requiring bribes are sometimes required. Another option is to arrange a tour or a car rental, though many of the roads are unpaved. Buses and trains have service between major cities, though bus schedules are sporadic and can be unsafe depending on road and weather conditions, and trains are quite slow.